For the first time in Vanuatu’s political history since 1980, three Kalsakau brothers from the same parents hailing from Ifira, Efate, have been elected MPs, according to provisional results. The unofficial results from Friday’s snap elections indicated the three brothers – Ephraim Kasakau, Ishmael Kalsakau and Joshua Kalasakau – have secured three seats in Parliament. They showed Ishmael Kalsakau and Ephraim Kalsakau in the six top lists for the six parliamentary seats in the Port Vila constituency while the youngest brother Joshua Kalsakau edged through in one of the Efate rural constituency seats. It may seem a surprise for many people of Vanuatu and the region or the world but for Vanuatu, it simply was that their father, the late George Kalsakau, who was the First Chief Minister in the first Representative Assembly leading to independence from Britain and France in 1980 and a well-known politician during the early political struggle, had prepared them for this time in Vanuatu’s political history. Their father prepared them to be leaders to take Vanuatu forward in the new political roadmap towards the political stability desired by the people. George Kalsakau was one of the first indigenous British police chief inspectors and then Superintendent in the British Constabulary during the Condominium rule by Britain and France. He studied in the United Kingdom as well as locally. He was highly respected by the British resident commissioners as an outstanding New Hebridean disciplined British Constabulary superintendent. 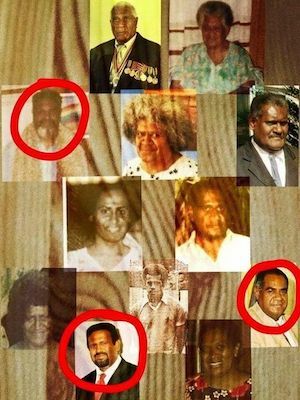 The three brothers’ late mother was the first New Hebridean female teacher who took up a teaching scholarship at the Nasinu Teachers College in Fiji. Upon returning home, she started the school that was later known as the British Primary School and today the Vila Central School. The three brothers contested on different political tickets. This is the first time in Vanuatu history that three brothers contested and secured seats in Parliament at the same time. It is also arguably a first in the Pacific region and perhaps globally.